I struggle with foundations. I struggle to find the perfect shade for my warm dark skin. I struggle to find the perfect formula for my combination (oily and dry) skin. Colourpop recently released foundation sticks which are the perfect medium between a liquid foundation and a pressed powder. It’s literally a cream foundation in stick form, for those who do not yet use them. I’m fond of foundation sticks and I normally use either Smashbox or Anastasia Beverly Hills. I am, however, very open to new brands that can better service my color-matching needs. The Question Is, Do They Meet My Color-Matching Needs? Maybe my skin tone is not one that comes with a perfect match foundation. I mean, honestly, my skin doesn’t need foundation anyway. I have beautiful skin! But, I do want the option to wear it, so help me out brands! Help me out. It looks like these would be perfect right? One for an all-over foundation and the other for a cool soft contour. BUT, the color of the inside of our forearm is NOT the color of your face. Of course it won’t work! Now, this isn’t a complete Hateogram to the whole Colourpop No Filter Foundation Stix line (because Colourpop is over there working pure magic with their products), it’s just me acknowledging and slightly complaining about the fact that, if and when I want to wear make-up, I’ll still be grabbing and blending two foundations to get that base going! XLIV: Travel Essentials, What Are Mine? I suppose I'll make the first essential shirts since I didn't have any while in Washington D.C. during the Labor Day holiday. Thankfully, I traveled with someone who wanted to absolutely spoil me for my birthday weekend! He took care of all of my clothing woes while we were away. Now that we’ve established that I need shirts, let’s talk about what type of shirts I wanted for the holiday weekend. Lately, I have been big on the long, dress-type shirts that are flowy and loose-fitting. Either that or a simple t-shirt dress! My “comfy shoes” are literally just Vans. I’ve been an avid Vans-wearer for approximately 19 years (Geez, that’s a lot of time). I remember back in middle school when Chuck Taylors were in, but my feet were too wide, so I ventured over to the Vans store and fell in love! Unlucky for me, however, the “Vans” song by The Pack became a big thing and my Vans store experience has been a crowded one ever since. This was an excellent thing for Vans, but an annoying one for me. Ah Well! I still buy them! I like to work out wherever I go. A big part of that has to do with the fact that I like to see what each gym has to offer. And, another part of that has to do with the fact that I'm already in the routine of working out regularly. So, I cannot travel without at least one pair of running shoes, always Nikes (even if I don’t get a workout in). Now, the chances of me actually putting on make-up when I go on a trip are slim to none, but let it be the case that I travel somewhere and don’t bring my make-up bag, I'd have a fit! I would definitely freak out as if I were actually going to wear make-up each day of my vacation (knowing that I won't). I haven’t found a highligher that I can’t live without just yet, so, if you know of one, tell a friend! I cannot travel without snacks for the plane! For some reason, the pretzels and soft drink just don’t hit the spot the way that the flight attendants want them to. Don’t get me wrong, I don’t need a full meal on a 4/5 hour flight, so I don’t expect the airline to change a thing, but I do snack quite often. Because of this, I know better than to travel without an arsenal of snacks in my carryon bag. We all know that traveling without entertainment has the potential to be some of the worst experiences of your life, so I usually bring my Kindle to catch up on blogs, books, and homework. On trips that I know I am going to shop until I drop, I always bring a carryon sized luggage and check it with the airport so that I don’t have to carry it around. This way, I am free to shop without worrying about going over weight with my bigger checked luggage (especially since I tend to overpack). I sometimes even put my extra travel sized items in this luggage, this makes it easier to bring a ton of lotions, soaps, bath bombs and different camera lenses. This is my newest travel essential. There’s something about seeing the city with the wind blowing in your hair! Each morning we woke up and hopped on our long boards to either ride to the monuments or to ride to Union Station for food and it just turned out to be a quicker way to see more of the city and to add a bit more adventure to our adventure! Welp, those are some of my essentials for travel, what are yours? XL: Lay the Foundation! Which Products Must You Have In Your Makeup Bag? The Makeup Industry Is On The Up And Up! There are so many great things happening in the world of make-up, but let us not forget where we've come from! Now, if I'm going to do a full face or anything close to that, then I have to make sure that my primer is on point and fully prepared for it! That's why I've relied on Smashbox. I started out using the Photo Finish Primer with the matte finish and gradually added to that the Photo Finish Primer Water which is just something that iI use to get my make-up brushes wet before evening out my foundation. 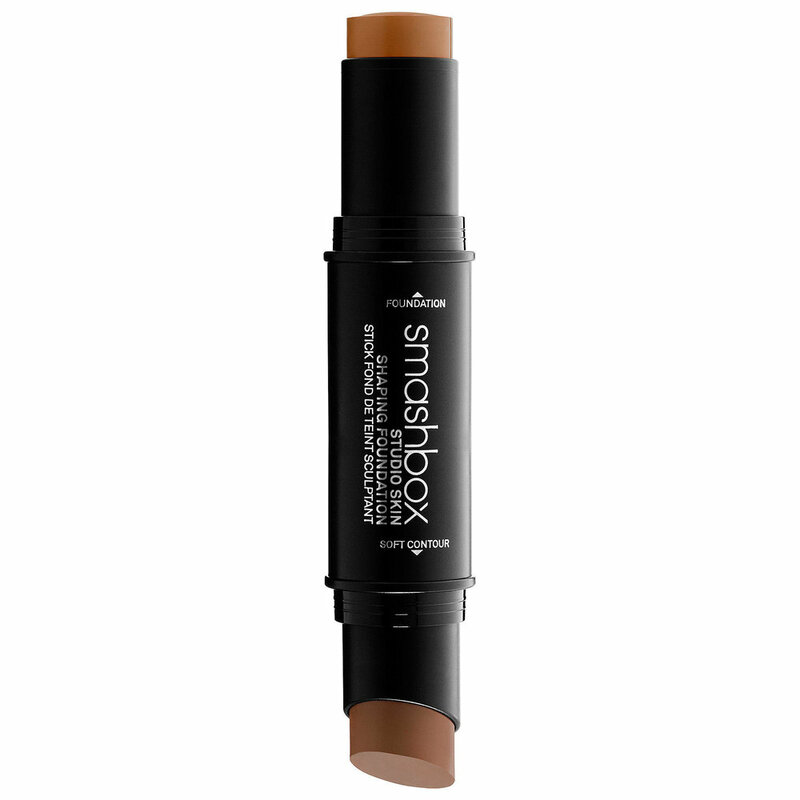 Now, I use the Smashbox Photo Finish Iconic Primer Stick which is almost exactly like the first primer that I listed above just in stick form. Now, my foundations change throughout the year (as I would assume everyone's does), but, for the most part, I have a system! I use a foundation with cooler tones in the winter and one with warmer tones in the summer. So, the summer is the only time that I am able to use my Anastasia Beverly Hills Foundation Stick because the warm undertones within the Ebony shade are perfect during the summer but make my face look ashy during the winter. When Fall and Winter roll around, I switch to my Smashbox foundations (either liquid or stick depending on how lazy I am that day). I use the liquid foundation in the color 4.3 and the stick combo in the same shade. If I had to choose between the two brands for foundations, I would definitely give the win to Smashbox. They absolutely know what types of undertones darker skinned women need and they cater well to those needs. Now, I love eyeshadows, although I only really wear a couple of colors over and over (oranges, browns and reds). I have pretty much found the brand that makes the shadows with enough pigment for me to survive with just my subpar make-up application skills. For an eyelid primer, as I'm sure I've mentioned before, Urban Decay's Potion Eyelid Primer in the color Sin is my go-to. If you want your eye shadow to stay on and never move, then this is the primer for you! After a good primer, I usually grab one of my many Anastasia Beverly Hills eyeshadow palettes. My current obsessions are the Norvina palette and the Soft Glam palette, which are the two latest palettes. I also have another go-to and that's the Rust Stack by Melt Cosmetics. This is a less common brand of make-up products, but they are most known for their cute and stackable eyeshadow palettes (it's probably better to call these stacks). They are a bit on the higher side in terms of price, but, for the product that you get, they are very much worth it. I am very particular about my lipstick. I don't like the super dry formulas that come with the explanation that, "matte formulas are more dry", and I hate an oily formula! Some brands are able to hit the nail on the head and Mac Cosmetics is one of them. Now, a huge negative about Mac's lipsticks is that some of them come with a smell -- it's like a crayon-type of smell which gets gross, of course. But, with such a wide selection and great collabs (like Taraji P.'s) I can't pass them up! Another brand that I've been enjoying is Anastasia Beverly Hills. Now, I am convinced that a lot of the ABH products are not made with darker women in mind (as far as the undertones), but, the products that are, are amazing. So, I definitely recommend a good majority of their shades if you're on the more melanated side of things like I am. Finally, a blush (I use Raizin by Mac) and a setting spray (I use Urban Decay's All Nighter setting spray). But anyway, start with a good base for make-up and then work your way through the products to find your go-tos! Maybe I'll post a make-up look soon! Be on the lookout for that. XXXIV: Fenty Beauty #MoroccanSpice Palette, Worth the Money? It Is a resounding and emphatic 'NO' from me. This palette has many things wrong with it and very few things right. Now, I love Rihanna! I mostly love her attitude because I swear her amount of unbothered is a forever mood. I also love that she is stealing the make-up, Puma, and lingerie industry but this product is not something that's helped with that takeover at all. Where did it go wrong for me? Once again we are plagued by the dry formula that is currently attacking the make up industry! Yes, eye shadow is supposed to be a dry product, but this product is a type of dry that makes it more like dust and less like eyeshadow. Also, it lacks in pigment. When you put this dry, chalky eyeshadow onto your brush to apply it to your eyes, you get a harsh slide of spaced out product that wouldn't please the most inexperienced of makeup artists (me). Because I just can't get over the fact that I spent $60 on an eye shadow palette that I cannot use, I guess we might as well stop the 'cons' here! But Was There Anything Right? The packaging is absolutely beautiful (maybe that's where the $60 that the palette costs went to and not the actual product). When you open the box of the product, there is a purple cardboard slide-out piece which has a top flap that easily pulls open. Once open, you have access to the palette. The palette is about the size of my hand (take into consideration my piano fingers guys). It is a beautiful purple color with a floral design in the middle. The package is slimmer than a lot of eyeshadow palettes which either means that you get less make up for your buck or that it will be perfect for traveling with the product -- perspective. Let's assume, in a perfect world, that I just used the wrong eyeshadow primer (because I didn't use the FentyBeauty primer)... Let's assume that Rihanna's primer would make the product apply flawlessly! If this is the case, then yes, get the product. But, I used Urban Decay's Sin eyeshadow primer which is solid gold and goodness, so I know that it is not the case that the primer made this shadow a miss instead of a hit. Overall, I'd say that you should pass on this product. HOWEVER, she did come out with a bomb eyeliner with a perfect tip! You should just save about $40 and get that $20 gem instead.